I loved this story. 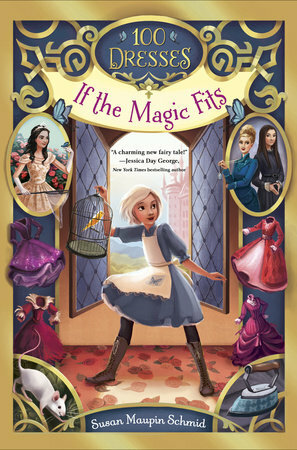 It has a strong female lead character, magic, a talking mouse, lots of dresses, and it's set in an enchanted castle. Darling Dimple was orphaned at birth, left to be raised by the under servants of the castle in the Kingdom of Eliora. She led a relatively carefree childhood, though now, at the age of ten, she has to find a job to earn her keep. She is quickly moved from washing pans to pressing the linens for the princess. Just days into that new position, she finds a room full of dresses, one hundred of them to be exact, and soon learns that they are enchanted. When Darling tries on a dress, she is transformed into one of the women in the castle. While roaming the halls in one of these disguises, she learns that all is not well in the kingdom and that Princess Mariposa is at risk. Can Darling and the dresses save her before it is too late. I fell in love with this book after reading the first few pages. I knew it was going to be a special story that I wouldn't want to leave after the final pages. Thank goodness, author Susan Maupin Schmid is writing Ghost of a Chance, the second installment in the 100 Dresses, due out Summer 2017. It is bound to become a favourite for young readers, one that they'll want to read again and again.